Railpictures.ca - Jason Noe Photo: During the night of February 10, CN A431 with 9675 and 9482 had a long and heavy train when it departed MacMillan yard in Toronto. Once on the Guelph Subdivision, the Niagara Escarpment grade proved too powerful for the two four-axle units. The train retreated back to (Silver) Georgetown and set-off the majority of its Stratford cars before trying another run at the grade. Eventually the units made it over and then go on to set-off 39 cars in Guelph before finally arriving in Kitchener after sunrise. The train then tied-down in Kitchener and CN would order an X431 to lift the cars left on the Halton Subdivision by A431 and bring them the remaining distance to Kitchener. 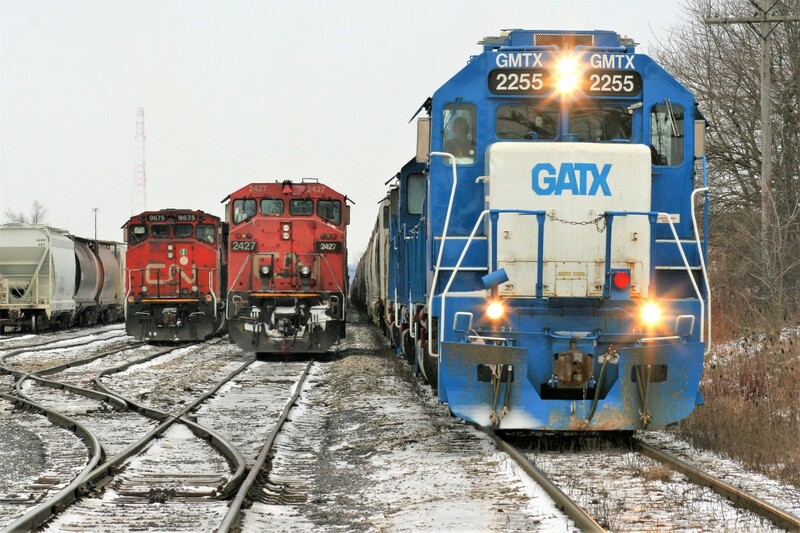 Here pictured in the Kitchener yard, CN train L568 with a trio of GMTX units waits on the mainline while A431’s power from the night before looks on along with X431 and 2427. | Railpictures.ca – Canadian Railway Photography – photographie ferroviaire Canadienne. Caption: During the night of February 10, CN A431 with 9675 and 9482 had a long and heavy train when it departed MacMillan yard in Toronto. Once on the Guelph Subdivision, the Niagara Escarpment grade proved too powerful for the two four-axle units. The train retreated back to (Silver) Georgetown and set-off the majority of its Stratford cars before trying another run at the grade. Eventually the units made it over and then go on to set-off 39 cars in Guelph before finally arriving in Kitchener after sunrise. The train then tied-down in Kitchener and CN would order an X431 to lift the cars left on the Halton Subdivision by A431 and bring them the remaining distance to Kitchener. Here pictured in the Kitchener yard, CN train L568 with a trio of GMTX units waits on the mainline while A431’s power from the night before looks on along with X431 and 2427. Thanks for all the comments, Kevin, Brad and Graydon. As soon as weather is a factor it seems or whenever A431 has trouble with the hill on the Niagara Escarpment at night is when the train has to be re-crewed at Kitchener. I could be wrong, but I believe this was the first time an X431 has been ordered from MacMillan to Kitchener since CN has taken back the Guelph Subdivision. When 2427 came in, they cut-off all the cars on the main and then L568 came out to lift them and then simply headed west to Stratford. 2427 then coupled to the power from the previous night’s A431 and eventually went to the east end of the yard to their awaiting cars for MacMillan yard. Great shot! It would seem GEXR had it figured out with the 6-axles and their power. But I’m sure they had a degree of difficulty as well. Three Blue’s on L568! I plan to model 1 of them! Wow awesome shots Jay!! Lucky Catch Indeed! Wish I was able to catch some of the action! From what I was told from some of my fellow young railfan friends, it seems that CN 431 has been spotted in daylight a handful of times so far this year and their timing can be pretty unpredictable as to when exactly they’ll pass by unlike GEXR how 9-10 times they’ll pass by a particular location at a certain hr. Is that really the case? And Steve if your reading this, yes I am aware that CN 540 had an emergency afternoon daylight run to Elmira a couple weeks back on a Thursday afternoon when it was like -30, -35 and since the coldness that week set pretty much everything behind schedule including transit systems, I have a feel for why the region gave such permission as their testing was probably held off anyway. Fingers crossed that I’ll see pictures of it someday and if im REALLY REALLY lucky, someday it’ll happen again and I’ll be in the right place to catch it! Money shot man! This is awesome. Action at Kitchener.